ChiIL Mama : CHICAGO YOUTH SYMPHONY ORCHESTRAS' SYMPHONY ORCHESTRA PERFORMS SPRING CONCERT AT ORCHESTRA HALL MOTHER’S DAY, SUNDAY, MAY 11 AT 7:30 P.M.
CHICAGO YOUTH SYMPHONY ORCHESTRAS' SYMPHONY ORCHESTRA PERFORMS SPRING CONCERT AT ORCHESTRA HALL MOTHER’S DAY, SUNDAY, MAY 11 AT 7:30 P.M.
with The CYSO at Orchestra Hall. Chicago Youth Symphony Orchestras’ (CYSO) 130-member Symphony Orchestra presents its spring 2014 concert at Chicago’s Orchestra Hall (220 S. Michigan Ave.), Mother’s Day, Sunday, May 11 at 7:30 p.m.
"With this program, we celebrate the evolution of instrumental music on an epic scale, from ancient to modern," says Tinkham. "There will be music featuring ethnic Chinese percussion, among the oldest known musical instruments, and music featuring the turntable, a machine we thought we knew for many decades, now an instrument capable of surprising musicality. We'll conclude with Bartok's iconic “Concerto for Orchestra,” named for its virtuosic treatment of every instrument in the orchestra. It will be an exciting and highly entertaining evening for musician and audience member alike." The Faust legend was based on a real person, Johann Faustus, who bragged of having supernatural powers, and being a companion of the Devil. This eventually morphed into the legend of a man who sells his soul to the Devil in exchange for power and gratification of all his desires while he’s alive. In the Mephisto Waltz No. 1, we find that Mephistopheles (the devil) has taken up a violin, playing a feverish waltz so that Faust can have the chance to dance with and romance a girl who he has met during a stop at a village inn. Many Eastern composers have utilized the soundscape of Western instruments to transmute their musical ideas. In “The Rhyme of Taigu,” Zhou Long transforms the orchestra into an engine of energy and pulse, evoking the ancient drum ceremonies of the Tang dynasty (preceding the Japanese iteration, taiko), and the power of the largest Chinese drum called dagu. Guest Turntabilist, Jordan "Madhatter" Lee. Within the last century, the combination of electricity and music has revolutionized composed sound. Prokofiev’s “Concerto for Turntables and Orchestra” merges thousands of years of music making into a synthesis of ancient and ultra-modern. In this work, the turntable serves as an instrument and the turntablist (or DJ) is the solo musician, employing hip-hop and pre-recorded sounds from the orchestra to put an entirely new spin on the power struggle and dialogue between soloist and ensemble inherent in the concerto tradition. In the 20th Century, when borders and governments started to rend, and the world tumbled into two world wars, Bartók (along with many other European composers) left to take up residence in the U.S. Sadly, he would discover he had leukemia, and would never return to Europe. Right before his diagnosis, the famed conductor of the Boston Symphony Orchestra, Serge Koussevitzky, commissioned Bartók to write a piece commemorating the recent death of Koussevitzky’s wife, Natalie. The result was Concerto for Orchestra, which became Bartok’s his final orchestral work. Albert Pick III Award –This award, inspired by the memory of Albert Pick III for his love of the students of CYSO, comes with a $1,000 prize and is given to a well-rounded individual with the intent to be used to keep music a creative and joyful part of the recipient’s life. That evening, CYSO will also present the “Note of Excellence Award for Outstanding Achievement by a CYSO Alumnus” (recipient to be announced). Past recipients for this award have included Seattle Symphony principal flutist Demarre McGill and his brother Anthony McGill, Principal Clarinet of the Metropolitan Opera; and premiere performance artist Laurie Anderson. Chicago Youth Symphony Orchestras (CYSO) presents its spring 2014 concert at Chicago’s Orchestra Hall (220 S. Michigan Ave.), Mother’s Day, Sunday, May 11 at 7:30 p.m. Tickets are $20-$40. Boxes available at $50 per seat, Children 7 and under free. Tickets on sale now. For more information visit cyso.org or call 312-939-2207 x310. 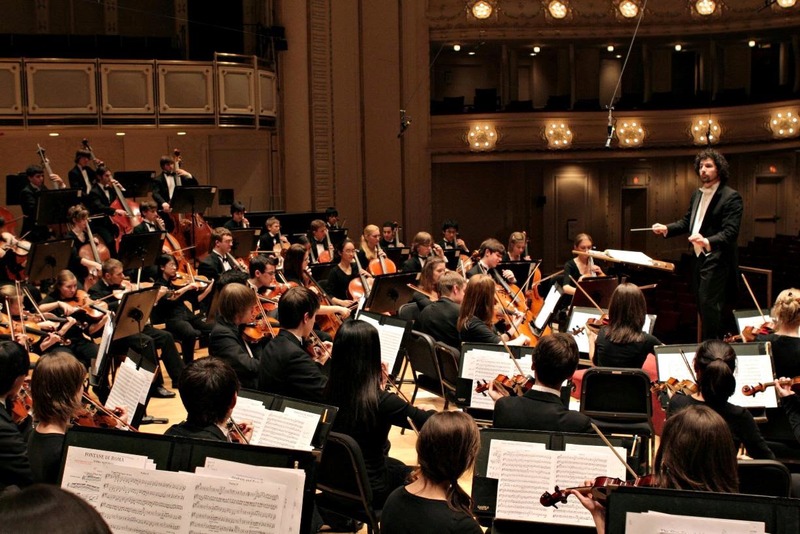 CYSO’s Symphony Orchestra has earned an international reputation as a premier orchestral ensemble featuring extraordinary young musicians from the Chicago area. Allen Tinkham was appointed Music Director of CYSO in 2001. During his tenure, CYSO has won eight of its 11 ASCAP National Awards for Adventurous Programming of Contemporary Music, as well as four Illinois Council of Orchestras awards (two Programming of the Year Awards and two Youth Orchestra of the Year Awards). Under Tinkham’s direction, CYSO ensembles have performed at Orchestra Hall, Millennium Park, Ravinia, Carnegie Hall and several international locales. CYSO has taken the stage three times at Lollapalooza, Chicago’s legendary rock music festival, the first time in August 2007 when it became the first ever classical music ensemble to do so. This summer, CYSO’s Symphony Orchestra will perform a free public outdoor concert of selections to be performed during its June 2014 tour of China at the Jay Pritzker Pavilion in Millennium Park on Sunday, June 8, 2013 at 6:30 p.m.
Chicago Youth Symphony Orchestras (CYSO) has provided music education through orchestral programs and performance opportunities of the highest caliber since 1946. CYSO currently serves 475 Chicago area musicians ages 7-18 through three full orchestras, two string orchestras, multiple steel orchestras and supplemental programs that include chamber music ensembles, music theory and composition. It also reaches the diverse population of Chicago Public School students, educators and community members each year through its Music Pathways program. Music Pathways includes an In-School Residency Program with several partner Chicago Public elementary schools, Clinics for partner Chicago Public high schools, free Community Concerts, a Private Lesson Program for current CYSO students and Neighborhood Ensembles. CYSO, a 501(c)(3) non-profit organization, is investing in the future of music and the next generation of leaders. For more information visit www.cyso.org or call 312-939-2207. CYSO also can be followed on Twitter at twitter.com/ChiYSO. Like CYSO on Facebook at facebook.com/ChicagoYouthSymphonyOrchestras.